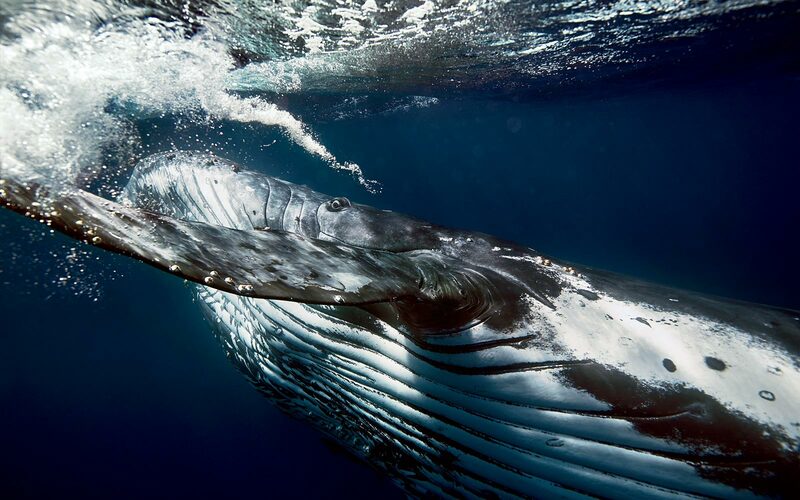 Humpback whales’ ventral pleats let their throats expand to accommodate water during filter-feeding. The waters of the South Pacific are the domain of some of the world's largest creatures—and a place where, sometimes, beauty can conquer fear. A confession: I’ve always been afraid of deep water. Like most phobias, mine isn’t entirely rational. It’s not about drowning, exactly, or being eaten by a sharp-toothed creature, although that wouldn’t be ideal. It’s more about not knowing what’s below me, about darkness and emptiness and my own insignificance. And yet there I was, floating in the open ocean, peering down through a snorkel mask into water hundreds of feet deep. Above the surface there was wind and swell, blowing spray, gray sky. In the distance were the limestone cliffs and tousled coconut palms of Vava’u, an archipelago of 61 islands within the Kingdom of Tonga, itself a collection of 176 islands scattered across approximately 260,000 square miles of the South Pacific. Beneath the surface, there was stillness, vastness, silence. There was the saturated cobalt blueness of the Tongan waters, and there was a mother humpback whale 50 feet below, resting with her calf tucked under her. The sight was both familiar and alien. I’d seen countless humpbacks on television and IMAX screens, gazed up at life-size replicas hanging from the ceilings of natural-history museums, even caught glimpses of flukes and fins from whale-watching boats. But now I was floating above a 40-ton, 50-foot-long animal with a beating heart and a mind full of unfathomable instincts and impulses. The white edges of her pectoral fins and fluke glowed bright aqua. The rest of her was a massive charcoal shadow, suspended in space. Nisi Tongia, a local guide who works for New Zealand–based WhaleSwim Adventures, gripped my wet-suited upper arm, anchoring me against the current. We formed a loose cluster with three other swimmers—five of us in all, the maximum number legally allowed in the water so as to avoid crowding the whale. Because scuba diving with the whales is not permitted, we had only snorkels and fins. This was our first of seven days in the water with WhaleSwim Adventures, a tour operator that has led recently expanded to Tahiti (humpbacks) and Sri Lanka (blue and sperm whales). The company offers only multi day trips, a policy intended to give swimmers time to get used to the whales and to avoid pressuring guides into forcing encounters. Sometimes, though, while sitting on the boat’s swim platform, my fins dipping in and out of the wake as I craned around to see columns of vapor sent up by exhaling whales, I did find myself caught up in a certain hectic energy, an Ahab-like thrill of pursuit. The challenge of finding whales is part of what makes encountering them meaningful, but because the quest can be so unpredictable (big ocean, swift wild animals), swimming with these creatures is an activity I can’t recommend for control freaks. 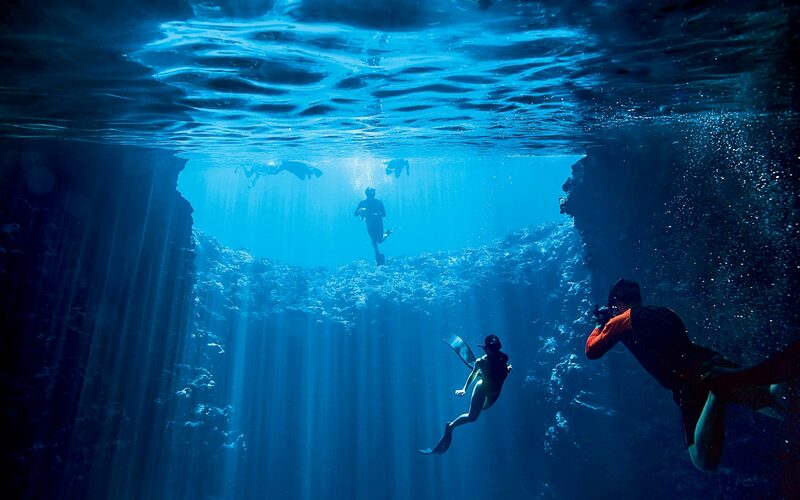 Divers descend into Swallows Cave, a popular spot in the Vava’u archipelago. On this drop, everything was going according to plan. A pale face, small by whale standards and studded with the wart like tubercles characteristic of humpbacks, peeked out from under After a moment the calf emerged and glided upward, nose to the light, eye trained on us, inspecting. A clutch of remoras, or suckerfish, clung to his underside, and his white belly was grooved with expandable ventral pleats that would, in adulthood, help him filter up to one and a half tons of krill a day. For now, he was consuming only milk, while his mother ate nothing. The warm, protected Tongan waters provide safety during the whales’ birthing and breeding season, but no sustenance. In a few weeks, this pair would turn south, toward their Antarctic feeding grounds. The calf took a breath, rolled languidly onto his side, and started wiggle-swimming in our direction. This was what I’d come for. This was an experience I’d wanted so badly that I’d put aside my trepidation about Big Blue and embarked on a 5,000-mile pilgrimage that could well have ended up becoming an exercise in terror management. Just a few feet from me, the calf rolled onto his back, opening his knobby pectoral fins wide. We made eye contact: a six-week-old, 18-foot-long marine mammal and a woman from California. What could he have made of me? His beauty thrilled me almost to the point of pain. His mother ascended, surfacing to breathe. At such close range, her size was overwhelming, a moving wall of whale, her skin encrusted here and there with barnacles. Her body language was relaxed, tail and flippers low, but she kept her eye fixed on the gaggle of snorkeled paparazzi extending GoPros toward her hammy, curious baby, who was now turning a backward somersault. In the water, whales’ conversation is often audible, and after a few whistles passed between the pair, they swam away unhurried, their oscillating flukes vanishing into the blue. Tonga is not one of the South Pacific’s most storied destinations, but the upside to its obscurity is that it is relatively unspoiled. On the island of Vava’u, the largest in the archipelago, the cows, pigs, dogs, chickens, and children are all free-range. Walk more than 20 feet and someone will offer you a ride. Island time is strictly observed. In the harbor of the main town, Neiafu, white yachts float at their moorings while small fiberglass boats put-put among them, people from outlying islands crowding the bows and perched on the roofs on their way to shop or pick up their kids from school. Storefronts offer day trips to go reef diving and sport fishing. Waterfront cafés like the Mango and Aquarium have pleasant decks for afternoon beers and hearty pork or seafood dinners. In the evenings, hymns waft from the churches, only to be drowned out, at sunset, by a roaring chorus of cicadas. Every Wednesday night at Bounty Bar, above the harbor, a wry and regal matriarch in a mesh dress and sensible shoes presides over a rowdy drag show and dance party. Her name, both in life and onstage, is Brian. Though Fetoko Island is only about 70 yards in diameter, the Newtons found space for some big ideas. Ben’s swooping design for the open-air restaurant was inspired by, among other things, manta rays and fractal geometry. Upon arrival by boat, guests are greeted by the couple’s two dogs, Higgs and Boson, named after the Higgs boson, a theoretical subatomic particle. All electricity is supplied by solar panels and all water by the clouds. The toilets operate on a composting system, and plans are afoot for an aquaponics garden, which will allow them to grow more of the resort’s (excellent) food on site. There’s talk of keeping chickens and dairy cows on a nearby island, since there isn’t space on Fetoko. To that end, he and Lisa traded the rat race for the boat. “We sailed through the Golden Gate and turned left,” he said. Three years later, they arrived in Tonga. Money ran out a few times while they were building Mandala, but the rewards have been rich. “How do you beat the tropical island lifestyle?” Lisa asked. As I sipped a rum cocktail in a hammock on Mandala’s beach at sunset, I wasn’t sure you could. As undiscovered as Tonga remains to most people, whale swimming is drawing a growing number of visitors—from a few hundred annually in the early 1990s to more than 3,000 a year in the past decade. That might not sound like a lot, but as with any other tourism enterprise built around encounters with wildlife, whale-swimming companies must balance a desire to spread the gospel of conservation with the risk of intruding on the animals and disturbing their habitats. Australia, the Dominican Republic, and Tahiti are among the few countries besides Tonga that allow operators to put customers in the water with humpbacks. To its credit, Tonga has regulations in place to protect the whales—limits on lengths of swims, mandatory breaks between encounters, prohibitions on harassing the whales, and caps on the number of swimmers allowed and boat licenses issued—though these are largely self-enforced. From left: Nisi Tongia, a Tongan guide who works for New Zealand-based WhaleSwim Adentures; Mandala Resort on tiny Fetoko Island; WhaleSwim's boat Blue Sky; a room at Mandala; Ofu, one of the many small islands in the Vava'u archipelago. Every Saturday, the Tongan whale swim boat captains get together to share a meal and talk shop, as part of a conscious commitment to maintaining a cooperative bond. “It’s good for us if every swimmer sees a whale,” Po’uli Tongia, our skipper and a first cousin of Nisi, told me. “We try to help each other.” The skippers keep in radio contact throughout the day, pooling intel about whales’ locations and behaviors. If one boat isn’t having any luck and another has found a whale amenable to encounters, the two boats might take turns dropping swimmers. On an afternoon when the whales were giving us the cold shoulder, a small boat of day-trippers offered to share a mother-and-calf pair with us. The other swimmers wore blocky orange life vests and held on to a float while their guide towed them. Such arrangements weren’t uncommon, Annah said, as some tourists who couldn’t swim still wanted to see whales. This elicited a few derisive snickers on our boat, but Annah said she admired the day-trippers’ bravery. Then Po’uli learned over the radio that the group was a Japanese ambassador and his family. 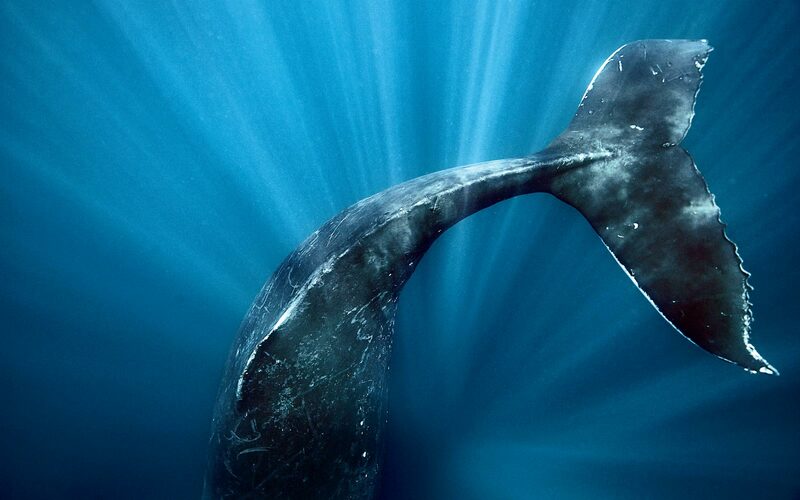 Japan, we all knew, is one of the few nations that has persisted in commercial whaling despite international censure. We fell silent, watching the orange dots on the water. “Let’s hope they have a wonderful, awe-inspiring experience,” Annah said. A humpback, seen during an excursion with WhaleSwim Adventures. In my seven days on the water, we found whales every day, but every day—and every encounter—was different. We floated for 45 minutes above a male as he sang to attract a mate, the water coming alive with whistles, chirps, trills, moans, and groans that rattled my ribs. We dropped into a group of five males on a heat run, all chasing a female, and found ourselves immersed in whale chaos. The boys, unafraid, spiraled around us, grunting. As one slid by just under my fins, another passed within arm’s reach to my left, and a third came up from the deep. Gliding and gigantic, they seemed always to be watching us, always careful to arc their flippers over or under us and not to whack us with their tails. We drifted on glassy, calm water above a placid mother and calf, their bodies dappled by sunbeams slanting down into the indigo water like light in the nave of a cathedral. We rocked and rolled on five-foot swells as a different, feistier calf shot up from below and fully out of the water, breaching just yards away. Its mother followed, rocketing up like a missile, water streaming off her as she arced against the sky, fins outspread. As the splash rained down on us, we cheered, exhilarated by her magnificent exuberance. If there was time after lunch, we might go for a non-whale-related snorkel. Near the end of our trip, one such excursion brought us to Mariner’s Cave, on the island of Nuapapu, where we dove down alongside a sheer, coral-encrusted drop-off and through an underwater tunnel into a black hole of rock, a humid air bubble encased in limestone. Such a place was once the stuff of my nightmares, but I finned into the darkness without hesitation. I wish I could say that my swims in Tonga were acts of courage, but my fear of the deep, which had seemed like a part of me, had turned out to be nothing at all—a coward that turned tail as soon as I looked right at it. I hadn’t been afraid, not since my very first drop, when I found myself surrounded by a blue so intense that the sensation was not of dangling above an abyssal depth but of being suspended in light, cradled by color. Wonders are waiting on the other side of our fears: singing whales and hidden caves, the bluest of blues. Fly from Sydney or Auckland, New Zealand, to the Tongan island of Tongatapu. From there, Real Tonga Airlines flies to Vava’u twice daily, except Sunday. Fiji Airways also offers a direct flight to Vava’u from Nadi, Fiji, twice weekly.